How would you have voted in 1975? 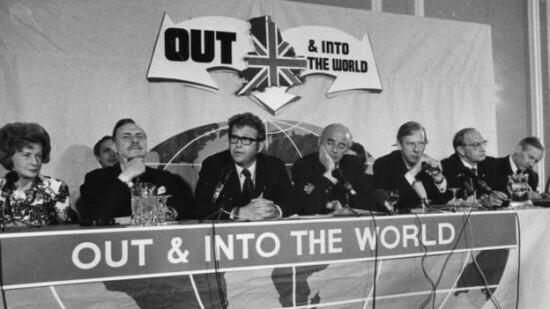 The first national referendum about the UK's relationship with Europe took place 41 years ago and began the process towards 'ever-closer-union' between the UK and the EU. The UK joined the European Economic Community in 1973 under Edward Heath’s Conservative government. In 1975, Labour's Prime Minister Harold Wilson attempted to renegotiate Britain’s relationship within the EU, similar to David Cameron’s attempt to establish a ‘special status’ four decades later, however, the result was deemed unsatisfactory for the country. 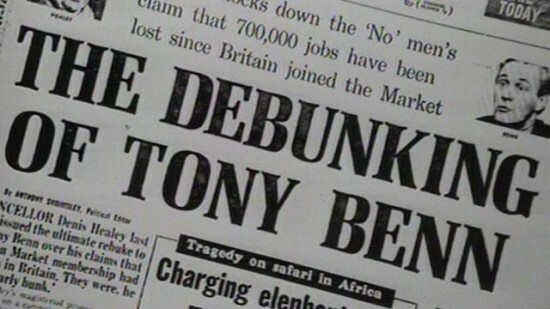 On 5 June 1975, in accordance with the Labour manifesto, a referendum was held to determine whether Britain should remain a member of the European Economic Community (Common Market). The question was simple. Yes or no? 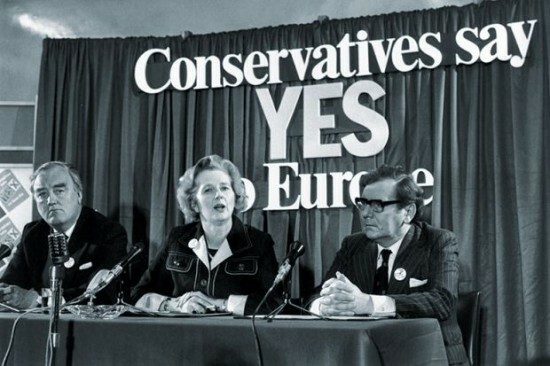 Home Secretary, Roy Jenkins headed the Yes Campaign which pushed to keep the UK in the common market. He vowed he would resign if he lost the vote. Industry secretary, Tony Benn, alongside Ulster Unionist Enoch Powell with Labour MPs Peter Shore and Barbara Castle headed the No Campaign. The Conservative party was predominantly pro-market, while the majority of the Labour party were against. Benn was widely mocked and parodied by the media throughout his campaign. It was acknowledged that remaining part of the EEC would result in UK sovereignty being pooled with that of the other eight member states. The main argument of the Yes campaign was that Britain could no longer remain alone in a modern world and through unity a path to peace could be assured. Memories of the Second World War held enough sway to reinforce that idea. The public was assured British traditions were not under threat. At the time, decisions made by the EEC were subject to a Prime Minister’s veto. Today, the opportunity for a Prime Minister to veto EU decisions no longer exists. The UK public was assured during the campaign that the EEC’s powers were limited to certain commercial and industrial purposes only; safeguarding British traditions and sovereignty. Over the years, these powers have expanded over other aspects such as law, new trade deals, and immigration. Britain was required to cut trade-relations with most Commonwealth nations and replace them with EEC trade deals. Britain relinquished the remaining parts of its empire in 1975. Future decisions and treaties would only be negotiated internally within the European community. Following the referendum, the Sun newspaper ran the following headline: "We are all Europeans now". The 1975 referendum resulted in 67.23% to 32.77% in favor of remaining part of the EEC. The Yes Campaign received 17,378,581 votes whilst the No Campaign received 8,470,073 votes. 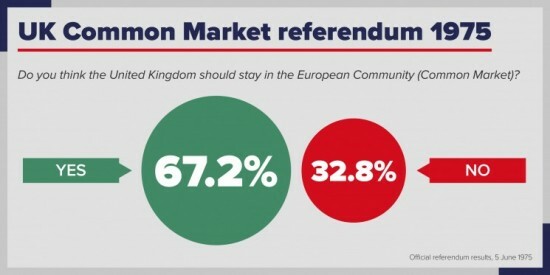 The UK’s membership of the EU would continue for another 41 years until the second referendum in 2016 where the results were 52% in favor to leave the European Union. The European Union was not officially created until 7 February 1992 after the signing of the Maastricht Treaty which created the structure of the EU we know today and introduced the Euro as a common currency and freedom of movement between European countries. The types of EU laws are EU regulations and EU directives. Regulations apply automatically to all member states once passed. Directives are goals that are set to individual member states. These must be implemented into national law. According to the House of Commons, between 1993 and 2014, Parliament passed 231 pieces of EU legislation into law. 4283 EU directives were also implemented over the same period of time. This results in the creation of 13% of the UK's laws. With the addition of EU related acts of parliament and statutory instruments, 62% of UK laws are directly influenced by EU directives but this legislation does not require approval from any national governments. The EU currently has 28 member states, seven Presidents, a Parliament, a Council, a court, an anthem, and a currency.